News : Please watch this video presentation at optimate. The demand for stabile execution of batch jobs in Dynamics Ax becomes more and more important as complexity of business running Dynamics Ax increases. Advanced Ax Batch is a solution based on some of the newest .NET technology and it uses proven built in Windows technology to ensure a stable batch execution environment. 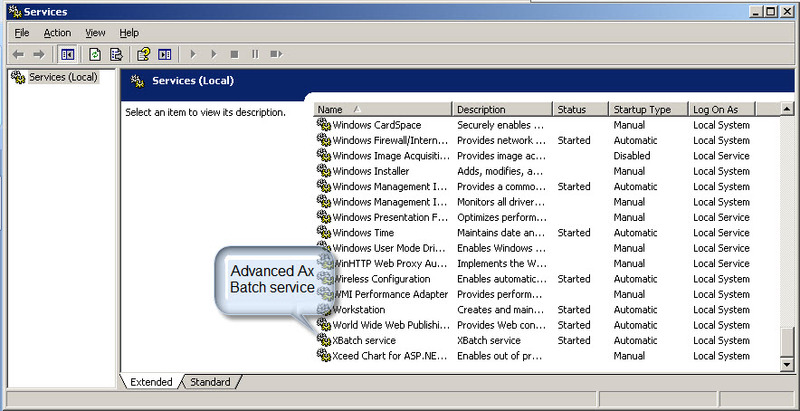 Advanced Ax Batch also includes a highly extensible event monitoring system. 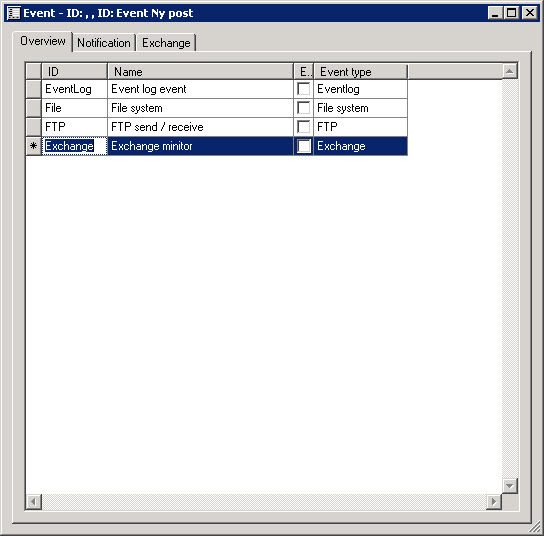 Examples of events are changes to the file system or new entry’s in the event log. Advanced Ax Batch is available for Dynamics Ax 3.0, Dynamics Ax 4.0 and Dynamics Ax 2009 client side and standard batch execution. Advanced Ax Batch was designed with the following goals. 1. Remove the need for a running Dynamics Ax client. Job execution is service based with better security and the ability to run in the background. 2. Increased stability by integrating Ax with the powerful built in windows scheduling service (Scheduled tasks). The integration is based on Windows communication foundation (WCF). 3. Deep integration with the event log. This gives the ability to monitor the scheduling system with event log monitoring systems. 4. Performance counters ads the ability to monitor the health of the system. 5. Manageability. Configuration and setup is Ax based with seamless integration of external services. 6. Job sequences. Execute a batch group or class depending on the result of a previous steps. 7. Highly extensible event system adds event monitoring to the job scheduling system. 8. Reduced cost by using Com users instead of regular Ax users. 9. 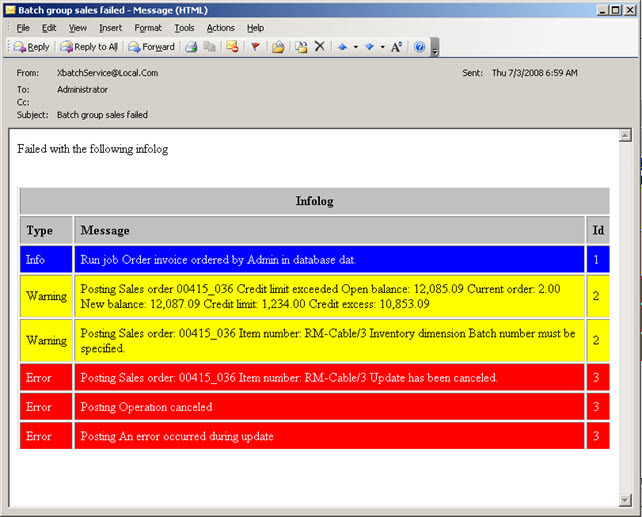 Advanced notification through email when a job succeedes, fails or times out with detailed information from the infolog and eventlog included in the mail. Advanced Ax Batch is highly recommended by Triax A/S. Triax A/S is a large Dynamics Ax 3.0 installation with more than 200 users and departments in several countries. Triax A/S is dependent of a stabile Batch execution environment and has not been able to reach that goal with standard batch and other Dynamics Ax job schedulers. With Advanced Ax Batch we have finally achieved the stability in batch execution that we need. 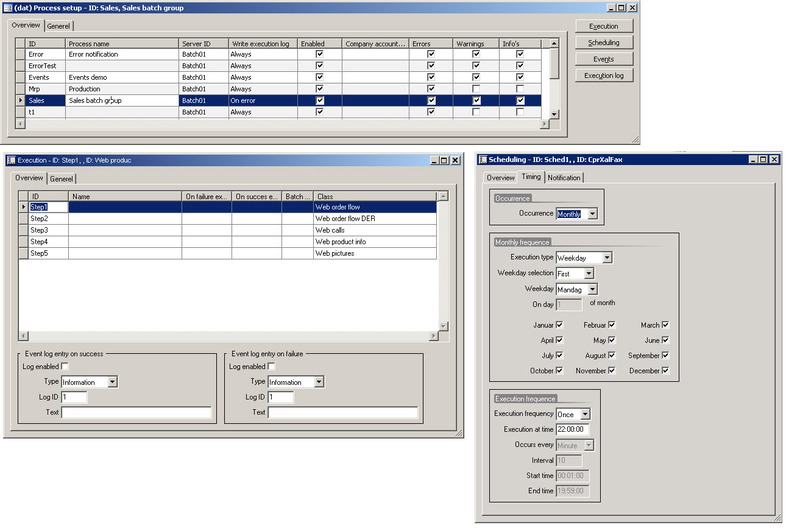 Scheduler based on standard windows functionality. The ability to monitor the batch system with MOM. User interface is Dynamics Ax which makes it easy to manage. 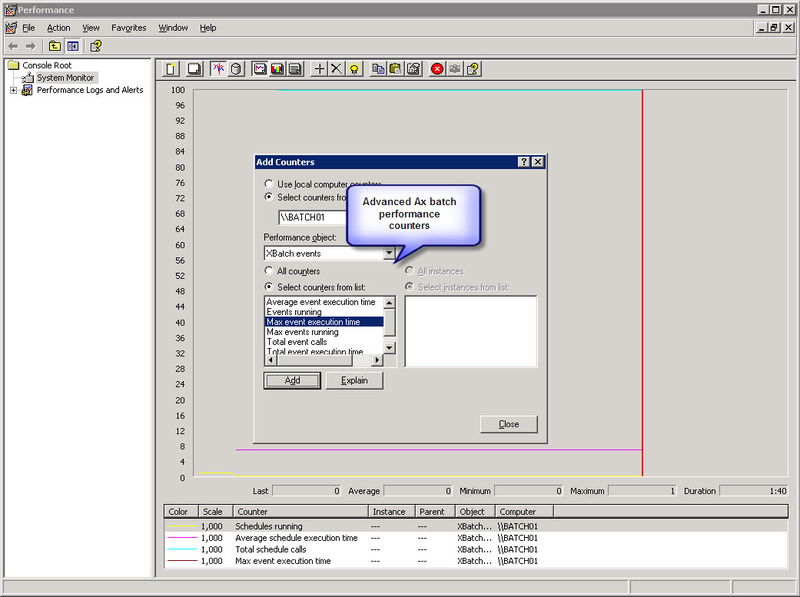 We highly recommend Advanced Ax Batch as the job scheduling solution for Dynamics Ax. More information regarding this powerfull solution will be added shortly.